One of my favourite things to do when I'm feeling down is bake. I always find it extremely relaxing and it always takes my mind off whatever is bothering me. To say the past few weeks have been easy would be a lie and every now and then I feel like it's all too much and feel really down. 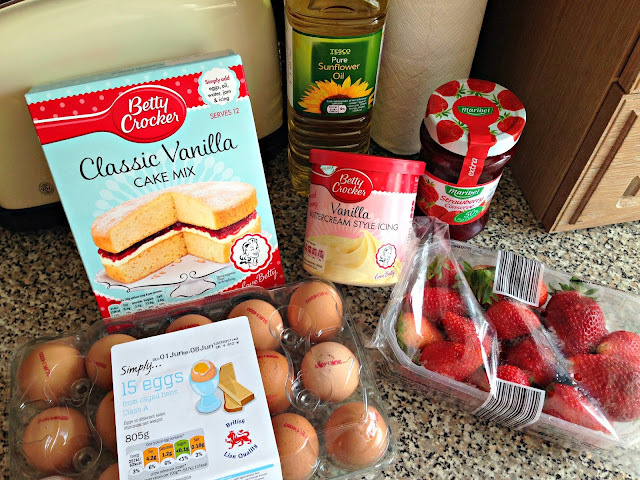 It all got a little too much this week so when I was out grocery shopping, I decided I would treat myself to my favourite, a Betty Crocker cake mix set. I've made a few of their mixes over the years and I've even made posts on my blog saying how gorgeous and tasty they are. This time I decided on the classic vanilla set with vanilla butter cream style icing but with my own little twist with fresh strawberries! Sorry this is a bit of a naff post but although I'm feeling low I still wanted to post my gorgeous cake! Yummy! Nothing beats cake as a pick-me-up! :) I hope you're feeling better soon lovely. Oh wow this looks so yummy! I'm really hungry now!!! this looks so yummy :D hope you feel better soon! Is it weird that I started tasting strawberries? Looks delicious! I love baking when I need a break from reality and that looks really tasty. I hope you start picking up soon, if not at least you've got plenty of cake to help you by! Oh my goodness that looks delicious and now I'm craving cake!! Do you know, me and my friends have been known to sit with that butterc ream icing and a spoon.. I'm sure you can imagine the rest!! (oooops hehe) it is SO delicious though. This cake looks wonderful! And so summery :) You've got me in a baking mood now! Oh my gosh YUM this looks so good! This look so delicious! Cake definitely cheers me up, now I'm craving a slice!